But will we see her rock Canadian style on her wedding day? Meghan Markle attends the Dawn Service at Wellington Arch to commemorate Anzac Day in London, Britain, April 25, 2018. The royal wedding is less than 48 hours away, and anticipation is building about who designed Meghan Markle's wedding dress (and what it looks like) almost as much as the event itself. This week, Markle's mom, Doria Ragland, was spotted carrying a Burberry garment bag as she made her way to the airport to fly across the pond to reunite with her daughter, causing the internet to wonder whether it held a clue about what Markle would be wearing on her wedding day. Although we won't find out who designed Markle's wedding dress until Saturday, many names have been thrown about, including Ralph & Russo, Alexander McQueen, and Roland Mouret. But some of us Canadians, especially those of us who have been fans of Markle since she started filming "Suits" in Toronto more than seven years ago, have wondered whether the 36-year-old former actress will opt for wearing a Canadian designer, such as Erdem, on her special day. Meghan Markle wearing Canadian brand Line during her engagement photocall at Kensington Palace in November. If she did, it wouldn't be completely out of her style wheelhouse. When she lived in Toronto, Markle was wearing Canadian fashion in her everyday life and she's been a champion of Canadian designers since she and Prince Harry got engaged in November. Whether or not Markle wears Canadian at her wedding, we still love that a soon-to-be member of the Royal Family is putting Canadian designers on the world stage. Here are some of Markle's favourite Canadian designers, some of whom could be contenders as her wedding dress designer. Erdem, created by Montreal native Erdem Moralioglu, has long been rumoured to be Markle's wedding dress designer, and with good reason. Markle has worn his signature floral designs at least a couple of times, including a gorgeous "Ava Night Bird Gown" at Prince Harry's friend's wedding in Jamaica last year, and a "Sebla Convertine Crepe De Chine Dress," which she wore in Toronto after the Invictus Games opening ceremony in September. Before she got engaged to one of the most eligible bachelors on the planet, Markle was the face of Canadian fashion institution, Reitmans. The former actress collaborated with the brand on two capsule collections in 2016, one of which was described by the Toronto Star at the time as a "five-piece line ... modelled after what she wears in real life, running from day to night engagements, on and off of planes." Pieces included a faux leather pencil skirt, grey and white ponchos, silk blouses, and a fitted black bodysuit. Markle told the Star that she wanted the collections to represent, "the girl I was when I was struggling to make it." But last April, Reitmans confirmed that their partnership with Markle had come to an end. Royal watchers first got a taste of the Canadian luxury outerwear brand when Markle's future sister-in-law, the Duchess of Cambridge, sported one of their iconic ribbed coats during her and Prince William's royal tour of Canada in 2016. And it seems like Markle is taking a page out of the duchess' style handbook. "Many will remember [Sentaler] as popping up on the royal fashion map after Kate wore it on the [royal tour of Canada]," Amanda Dishaw, editorial director of Meghan's Mirror, previously told HuffPost Canada, "but Meghan has been a fan of the brand for years, wearing their warm alpaca outerwear to bundle up against the Toronto cold in the past." Meghan Markle wears a Sentaler coat at a Christmas Day Church service at Church of St Mary Magdalene on Dec. 25, 2017. Markle also sported one of the brand's coats, the "Long-Wide Collar Wrap Coat," at St Mary Magdalene Church in Sandringham, U.K. for a Christmas Day service with the Royal Family, and was spotted wearing more of their coats while she was still living in Toronto. The "Meghan Effect" took off after she was spotted wearing a burgundy Wilfred dress, one of Aritzia's in-store brands, during the Invictus Games opening ceremony in Toronto last September. The dress was completely sold out hours later, thus marking the beginning of her status as a style icon. Meghan Markle in an Aritzia trench coat at the U.K. Team Trials for the Invictus Games Sydney 2018 on April 6, 2018 in Bath, England. Markle also took a khaki trench coat by Babton for Aritzia out for a spin during a visit to Bath, England, in April. At the same Invictus Games ceremony where she wore her Aritzia dress, Markle also wore another Canadian label, Mackage. The "Suits" star sported the brand's "Baya Moto" leather jacket over her shoulders, all the better with which to show off her gorgeous pleated dress. Meghan Markle wears a Mackage jacket at the Invictus Games opening ceremony in Toronto, September 2017. 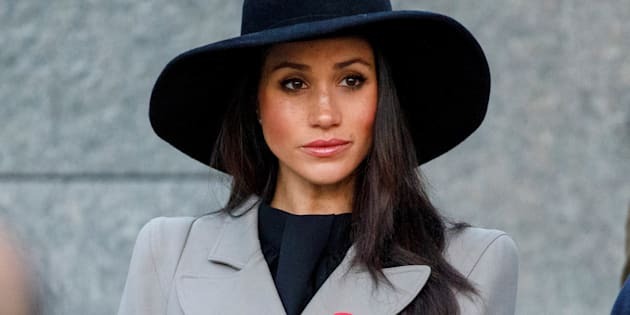 The Canadian label got an international audience when Markle wore one of their coats — the "Double Breasted Military Maxi Coat" for her and Harry's first official work engagement in December. And during her and Harry's surprise visit to Belfast, Northern Ireland, Markle wore the brand's "Mai Coat in Sand." The Canadian luxury jewelry brand is known for engagement rings, their "bee" collection, and their simple but stunning jewelry, and Markle is certainly a fan of the latter. "Birks has featured prominently in Meghan's jewelry box, most notably in royal engagement photos and at several engagements since. We love how she is keeping true to pieces, brands and styles that she embraced before her royal life began," Dishaw previously told HuffPost Canada. Meghan Markle wears Birks earrings on her way to a Christmas lunch for members of the Royal Family hosted by Queen Elizabeth II at Buckingham Palace on Dec. 20, 2017. Meghan's Mirror can count 10 instances where Markle has worn Birks jewelry in public, including their "Iconic Stackable Yellow Gold and Diamond Ring" at her and Harry's first visit to Wales; their "Snowflake Large Jacket Earrings" when she visited Buckingham Palace for the Royal Family's Christmas lunch (and again at Sadringham on Christmas day); and their "Rose Gold and Diamond Snowflake Ring" for her first official visit to Scotland. When the world saw the first pictures of Markle and Prince Harry as an engaged couple, they looked at two things: her engagement ring, and her gorgeous white Line wrap coat. Meghan Markle, wearing a white belted coat by Canadian brand Line, attends a photocall at Kensington Palace with Prince Harry. "Meghan has an effortlessly chic sense of style, which we've always admired. We know this particular coat is one of her favourite pieces so we have officially decided to name it the 'Meghan.' We are elated for Meghan and wish her a lifetime of happiness with Prince Harry," John Muscat, president and co-founder of the Canadian brand, told Today Style. Markle also wore a Line draped trench coat while watching the Invictus Games closing ceremony in Toronto. Smythe, known for their collection of luxury blazers, has long been a style favourite among celebrities and royals. (The Duchess of Cambridge is a big fan of the Canadian brand.) And Markle has also jumped on the Smythe bandwagon, wearing their "Brando Coat" during a visit to a South London radio station in January. "[Markle]'s owned this coat for over a year and has worn it previously," the label's designers told Hello magazine. "We are so proud and flattered that it made it to her new home in London." Meghan Markle wears a Smythe coat at an Anzac Day dawn service at Hyde Park Corner on April 25, 2018 in London. Recently, Markle wore their "Pagoda Coat" at the Dawn Service to commemorate Anzac Day in London. Markle's bestie, Jessica Mulroney, was also recently seen wearing Smythe. The Canadian bridal stylist was spotted in the brand's "Duchess" blazer while arriving at Heathrow Airport (her three children are part of Harry and Markle's bridal party) on Wednesday. While probably unintentional, it's a fun coincidence that Mulroney's outfit is a reference to a possible title Markle could get once she marries Prince Harry.